The Coult family farm likely started in about 1709 when Captain John Coult (1658–1751) built a house on Neck Road that still exists. Farming continued to be the family business for generations. 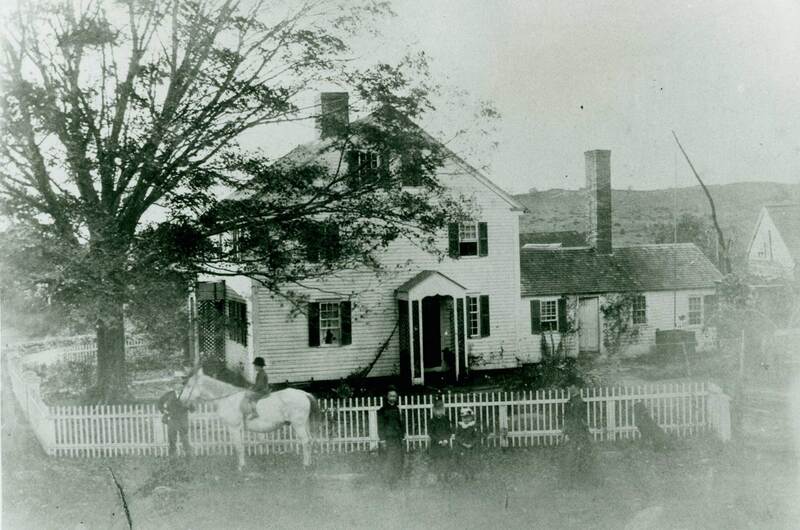 In the mid-1800s, William Ely Coult (1797–1877) ran the farm until he died, leaving his wife Ernestina Fisher Coult (1842–1919) with four small children. Ernestina, who had immigrated with her family from Germany in 1854, played a major role in running the farm business prior to and after her husband’s death. 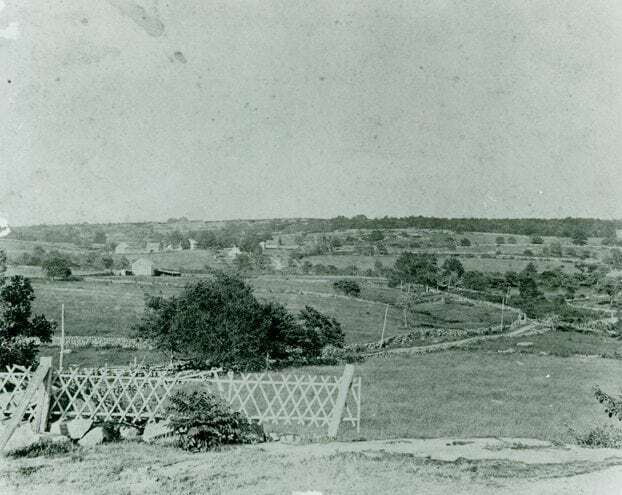 She continued to be supportive when her son William Fisher Coult (1871–1936) helped manage the farm at age 17 while a student at the Black Hall School. W. F. Coult continued to run the farm business until his death in 1936. 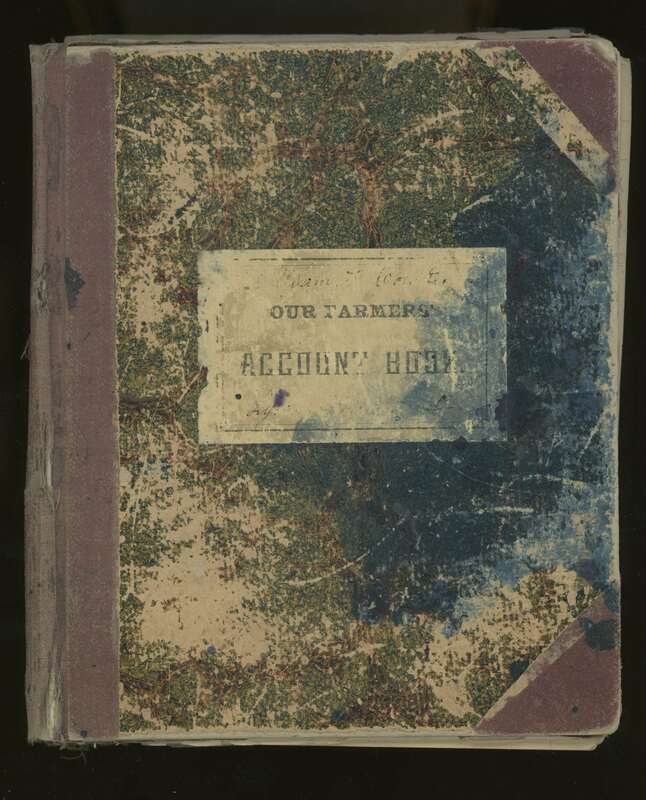 According to “Our Farmers Account Book,” which includes entries from 1888 through the 1920s, items sold by the Coult farm in the 1890s included meats such as beef, veal, pork, and mutton, live animals such as little pigs, young hogs, steers, bulls, horses and yokes of oxen, and other items such as eggs, potatoes, wool, cords of wood, boards, bales of hay, straw and quarry stone. In 1893 one transaction recorded a sale of cow meat. Sold in four packages, each with a weight slightly over 100 pounds, the beef was sold at 7 cents/lb. to R. S. Griswold and Sam Monroe. Lower priced meat was sold at 5 cents /lb. to Ansel Miller and Kept It Myself. Apparently, the Coult family also enjoyed beef. 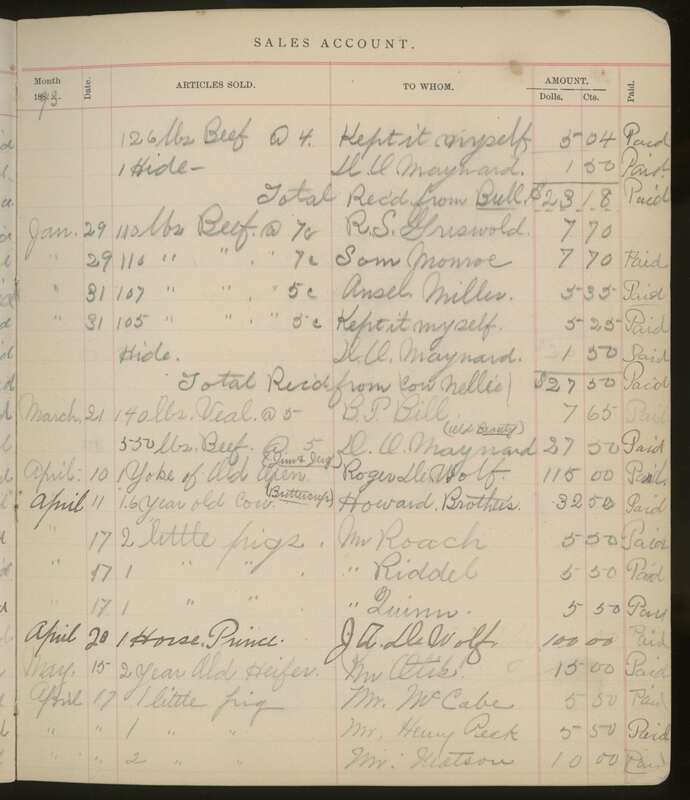 The hide was sold for $1.50 to D. Maynard who may have been a tanner or knew a tanner that he could sell the hide to or barter the hide for goods or services. The cow’s name was Nellie and her total proceeds were $27. It was the practice at the Coult farm to name some of the animals. Cows, bulls, horses, steers, and teams of oxen were given names that appear in the journal. Other animals such as pigs and sheep were not named. In addition to Nellie, cows were given the names Princess, Peggie, Dot, Brindle, and Buttercup. Bulls had the names Remo, Old Bill, and Old Tom, and horses had the names Prince and Champion. Steers were named Pete, Gray, and Dexter. Yokes of oxen were named Jim and Jerry, Tim and Tom, Sami and Lou, and Nip and Tuck. It is likely that Ernestina Coult and her children chose the names and, judging by the names chosen, that the family valued and were fond of the animals. Further information about the Coult family may be found in the blog article Profiles: Ernestina Fisher Coult (1842–1919).